It all started in December of 2006, when I moved home from college. I had one semester left of classes, and one semester of Student Teaching, and then I'd achieve my long-awaited (we're talking first day of second grade, here people!) dream of becoming an Elementary School Teacher. Clinton (who proposed to me one day after I moved home) had just joined a local FIRST Robotics Team (#1243) in Swartz Creek, after taking a 4-year leave of absence to attend college. He founded a team while he was still in High School, which was no longer in existence once he graduated, so onward he went. Before I knew it, I was attending the Swartz Creek Team's meetings, and started becoming part of the group, too. By the end of the season (which ended in April of 2007), some students had convinced us to start our OWN Team in Grand Blanc, which was about 30 minutes away from where I lived. We had to go through the grueling process of founding a team, recruiting students and mentors, finding a place to meet, getting funding, and so much more. Since I am the organization of Clinton and my relationship, I ended up doing nearly all of the leg-work. It turned out to be much more work than we had originally intended. Clinton and I have a tendency to go all-out, and never settle for anything less than the best. We worked diligently to build a team that was successful, and now here I am, nearly 6 years later, with an awesome Robotics Team, and no degree. We are the EngiNERDs, Team 2337. I am proud of the Team that we have built, and thankful for our successes every day. We have changed the lives of many high school students, and helped some get to college, when they likely would not have done so otherwise. In the first 4 years of our team, 5 students received college scholarships for $22,500 each, and so many more have been inspired by what we have done. Do I wish I had a degree and that I was teaching in a second-grade classroom somewhere right now? Sure. But I am a firm believer that everything happens for a reason, and that I've been lead down this path to accomplish something great. When I wake up in the morning, I try not to dwell on the "other" things that I could be doing with my life, and spend my energy thinking about the blessings that I already have. Here I am, 9 months pregnant, judging a LEGO League tournament. I swear to you, I thought I was going to POP right then and there! Clinton and I are very dedicated to what we do, and we somehow find a way to participate in Robotics year-round. Our Team's build season starts on the first Saturday after the New Year. We're given a challenge and game objective, then our Team has 6 weeks to design, prototype, build, assemble, program, and test a robot. We meet Monday through Thursday from 6:30 to 9:30pm, as well as Saturdays and Sundays from 9am to 9pm. 8 weeks after the Game is announced, we have our first competition. Clinton and I are on the planning committee for this event, where we spend 4 months organizing, and then bring our Team to compete in March. Occurring at the same time as build season, the two of us co-host a weekly conference call for Michigan Rookie Teams, and help them get through their first season. Competition falls on every weekend of March, and then the Michigan State Championship is in April, followed by the World Championship in St. Louis two weeks later. We have been to the World Championship three out of our four seasons, and to the State Championship each year. May is usually the month that we spend tying up loose ends, and the Team's parents host an Awards Banquet. Clinton and I make a special award for each of the students, which tells a story of something that happened during the season. Once the Students are out of school for the Summer, we meet two days a week, and spend our "off-season" doing community service projects, and attend competitions and demonstrations in June, July, August and September. One of the competitions we attend each September is Kettering Kickoff, and of course, Clinton and I are on the Planning Committee as well. October is spent gearing-up for the pre-season, recruting new students, meeting parents, and our newest outreach project, Extra Life. As a bit of a break, we only meet 2 or 3 days a week, which is the perfect amount of time to introduce new Students to the Team. The MMRA is an organization that Clinton and I helped found, which we participate in actively, year-round. 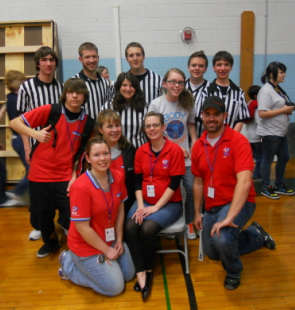 It's the Mid-Michigan Robotics Alliance, and I've been a board member (serving as Secretary) since 2007. We're a 501c(3) that helps spread the word of FIRST, and do year-round service projects and try to help raise funds for local Teams. Our most recent mission was to start 10 LEGO League Teams in the Flint Community Schools, and my contribution was to plan, organize and execute a training workshop for all of the Teams' Mentors. Which brings me to my next endeavor. I am Co-Head Judge for FIRST Lego League of Michigan, in the area of Core Values. I judge three tournaments a year, and am active in the planning process and rubric development for LEGO League. It makes me happy to work with Elementary-aged students at these tournaments; almost like I'm finally a teacher. Lego League runs October, November, and December each year. People ask me how I find time to participate in all of these activities, and to tell you the honest truth, I have absolutely no idea. Staying sane is a bit of a challenge sometimes, but somehow I manage. Robot Baby or Baby Robot? Some people use the six weeks following delivery to recover, I spent mine building a Robot and training a Chairman's team. Lucas was born just nine days before the FIRST Robotics Season Kickoff. For anyone who has been involved in FRC, you know that build season is rough. It's full of Team meetings every weekday night until 10pm, and 12-hour marathon Robotics on Saturdays and Sundays. Some students and mentors live for it, and others just wait for it to be over. Now, imagine if you will, that I did it with a newborn! Lucas has never known anything besides eat, sleep, poop... and robots. Our Team's build facility, Premier Tooling Systems, is like a second home to us and the EngiNERDs' students and mentors are like a second family. This picture was taken the very first time I ever left Lucas' side, which was for less than one hour. I returned from the Office Supply store to find this: Lucas, just 6 weeks old, playing on one of our Team's field Elements. Dad was supervising all of this "fun", of course. I thought that build season was going to be a complete nightmare, but it was actually the complete opposite. The Team was unbelievably supportive and respectful of me and Lucas throughout my pregnancy and recovery. At any given point in time, I always had a handful of people who offered to feed, change, and watch Lucas. Everyone kept telling me that they wanted to help, but I felt bad for enlisting the help of others, because I didn't want it to seem like I was pawning my kid off on to someone else. I got over that very quickly, and starting taking people up on their offer. I learned that it was okay to let someone watch Lucas while I took a cat nap, and that I wasn't the only one who didn't mind changing a poopy diaper, and looking back, I think Lucas is all the better for it. Somehow, I made it out of the 2011 FIRST season alive. When I think back on this year, I'm not sure how I did it. I remember all of the late nights at Premier, sleepless nights at home, and early mornings to head right back to Robotics, and I wonder what in the heck I was thinking! Here is Lucas in September, and how things have changed since that day way back in February. Lucas is still the cutest MiniBot the world has ever seen, and he has the Robotics repertoire to prove it! Lucas attended every day of every competition that our Team attended. 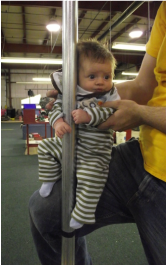 At just 10-weeks old, Lucas rode a charter bus all the way to St.Louis for the World Championship event. He really was a trooper. I was ambitious enough to breastfeed Lucas all while maintaining this busy and often times chaotic life, all the while using cloth diapers, and making his baby food at home. Granted, I did have lots of help from friends and family, but I have always been determined NOT to be the mom that dumps her kid off to someone else at every opportunity. Our Team won 2 of our 3 district competitions, and ended up in the elimination matches at every competition we attended. Not to mention that we earned the Chairman's Award this year, which honors a Team who, according to FIRST, "represents the spirit of FIRST. It honors the team that, in the judges’ estimation, best represents a model for other teams to emulate, and which embodies the goalsand purpose of FIRST. It remains FIRST’s most prestigious award.". Winning the Chairman's Award was a big milestone for me. It's easy to recognize the successes of the Robot, because that is what everyone sees. Since I run the "other" side of the Team (basically, everything that's NOT the robot), it was good for me to get some recognition for all of the work that the students do away from the robot. When I really think about it, I realize that if I can accomplish all of these feats, all while raising a kid, I can do anything. So when life gets you down, and you think that you have too much on your plate, just take a deep breath and remember that everything happens for a reason.